We provided an update on UNIT's dividend safety in February 2019 here. In April 2015, the struggling regional telecom company Windstream (WIN) spun off 80% of its fiber optic cables into an internally managed REIT which was later renamed Uniti Group (UNIT). The use of these assets was leased back to Windstream under a 15-year triple-net lease agreement. Under this arrangement, Windstream pays for maintenance, taxes, insurance, and any upgrade costs. In total, Uniti owns 4.9 million strand miles of fiber optic cables (used to provide broadband internet), as well as 667 telecom towers (227 in the U.S., 440 in Mexico), which serve the wireless phone industry. Uniti is one of the ten largest owners of fiber optic cables in America. Uniti is focused on diversifying its business away from Windstream, with a goal of generating 50% of revenue from other customers by mid-2019. Uniti's core business possesses several appealing qualities. For one thing, laying just one mile of fiber optic cable can cost over $100,000. When combined with the fact that there are only so many customers to service in any given area as well, competition tends to be quite limited. And once fiber is laid, it represents a low maintenance asset that has very attractive ongoing investment economics. More specifically, companies often build out a lot of spare capacity when they are laying fiber because of its high cost. As bandwidth needs continue to rise, they can later extend these extra fiber strands at a very low marginal cost to add new customers over time. Unused fiber optic cables are known as "dark fiber", and their marginal cash yield on invested capital can be as high as 15%. Uniti was spun off with about 80% of Windstream's large fiber network, which currently has just a 21% utilization rate. Uniti's non-Windstream fiber utilization is about 20%, with 460,000 strand miles of capacity that can be leased out to new clients in the future. In other words, the company's large mass of dark fiber appears to possess significant long-term growth potential. In general, telecom infrastructure has numerous appealing characteristics for REIT investors. 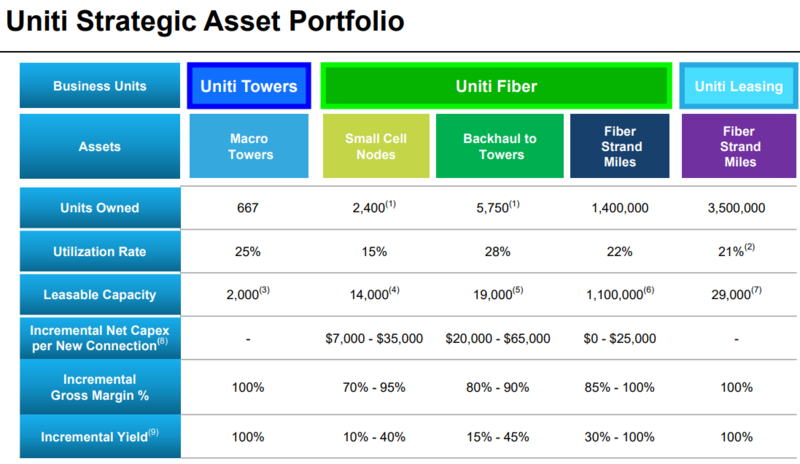 First, fiber and towers have very durable assets, with useful economic lives of about 50 years. Cash flow tends to be highly predictable as well. Customers, such as wireless carriers, sign very long-term contracts, and retention rates are extremely high due to a lack of competition (few substitutes and alternative suppliers are available to provide coverage in any single region). Uniti signs contracts are usually triple-net lease agreements, meaning that customers pay maintenance, insurance, and taxes. These leases generate very high gross margins because Uniti is essentially just the infrastructure landlord that collects highly stable and recurring rent. In the past few years, the REIT has spent billions of dollars to acquire new assets that diversify its rent away from its former parent company Windstream. This aggressive expansion has reduced the REIT's rent from Windstream from 98% of sales in 2015 to 75% today. In the first quarter of 2018, Uniti announced an agreement to do a sale-leaseback transaction with Telepacific holdings, or TPX, another small regional telecom provider. Uniti will pay TPX $95 million to purchase 38,000 fiber strand miles located across California, Nevada, Texas, and Massachusetts. In addition, the REIT will acquire 7,000 dark strand miles of fiber in Texas, meaning fiber that is laid but not yet contracted to customers. The TelePacific sale-leaseback acquisition has even more favorable terms than Uniti's original deal with Windstream, which carries on EBITDA margin near 99%. As you can see, the TelePacific deal includes a higher initial cash yield, three times faster annual rental escalators, and a much stronger tenant coverage ratio (tenant operating cash flow/rent). TelePacific, like Windstream, is a struggling regional telecom that is transitioning away from legacy landline phone service and towards an internet-focused future. While TPX shares the same junk bond credit rating with Windstream, the company has been more successful in its turnaround and appears to be at lower risk of being unable to pay its rent than Windstream. These are the types of deals Uniti is pursuing to continue down its diversification path. Ongoing investments and acquisitions into non-Windstream fiber are expected to be a major growth driver. In 2018, the REIT plans to spend about $172 million to expand its non-Windstream fiber capacity by 2,800 miles, or 9%, in 13 cities. Customers generally lease 7% to 15% of this new capacity at cash yields of 5% to 7% under 20-year contracts. The remaining capacity is then leased out over time to new customers as demand for fiber grows along with digital data volumes. Fiber optic cables are part of the backbone for the telecom industry and appear poised to become even more valuable as data volumes increase. This is especially true now that companies are investing in 5G wireless networks which are expected to provide significantly faster wireless data transfer speeds. 5G is already being tested by major telecoms such as AT&T (T) and Verizon (VZ) and is expected to be in widespread national use by 2020. In order to make 5G work, large amounts of fiber optic cables are needed to transport the data and connect to telecom towers and small cell networks. Carriers use these towers to send out the wireless signals that phones and internet services use. To capitalize on these developments, Uniti is investing across the board in fiber, telecom towers, and the connection pathways (nodes and backhaul connections) used to connect the two. Note that the current utilization rates for Uniti's assets are very low. Again, this is largely due to the unique economics of the industry. The high upfront capital costs mean that companies need to overbuild and then later lease out their dark fiber and telecom towers. Speaking of towers, analysts estimate that the shift to 5G will require about 25,000 new telecom towers in the U.S. alone in the next few years. Uniti hopes to capture 5% of that growth potential by building 1,250 new towers, nearly tripling its tower assets. 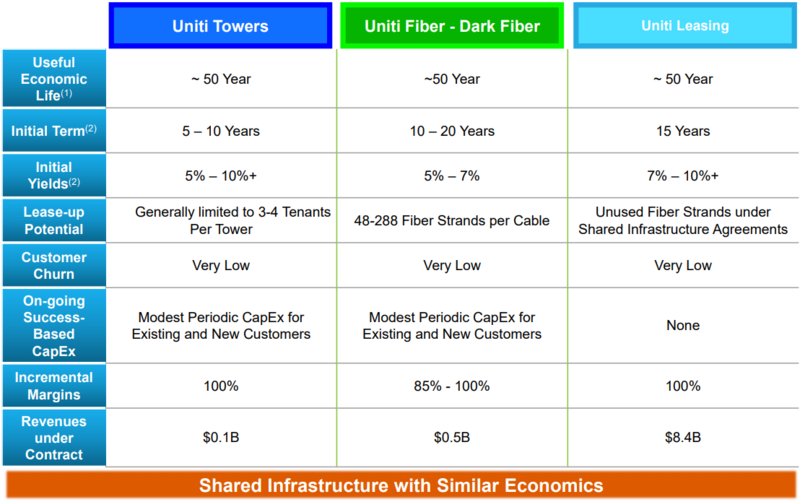 A telecom tower can be leased to up to four different tenants, meaning that like fiber, once the asset is built and in place, incremental revenue can be added at almost no addition cost, resulting in extremely high margins. While Uniti's future growth runway is potentially long, management must address the current challenges constraining the REIT's growth. Most notably, the company's overreliance on Windstream (75% of revenue in 2017), which faces a very real future threat of bankruptcy, is a core concern. Uniti is banking on two safeguards against this threat. The first defense is found in the Windstream Master Lease, which offers the REIT cash flow protection in the event of a Chapter 11 bankruptcy from its largest tenant. The master lease stipulates that Windstream must pay rent on all of Uniti's contracted assets if it uses any of them. In other words, it's essentially an "all or none" agreement. Since Uniti's fiber serves as the backbone of Windsteam's business, this theoretically ensures that even in Chapter 11 bankruptcy Uniti is entitled to receive payment in full. The lease also clearly states that it is not negotiable or alterable even by a bankruptcy court. Of course, bankruptcy proceedings can be messy, and Windstream's bond holders, especially the junior ones, could lobby for rent concensessions from Uniti. Still, even with the master lease theoretically guaranteeing Uniti's cash flow from Windstream, the (low) risk of a bankruptcy court rejecting the lease has caused Uniti's share price to fall so low that it can't raise equity growth capital at reasonable rates. Despite the challenges of raising capital in this environment, management has a goal of diversifying away from Windstream reliance and expects to achieve 50% non-Windstream revenue by mid-2019, a goal Uniti says remains on track. Uniti's turnaround plan hinges on expectations to continue growing the business both organically and through acquisitions. If successful, AFFO per share will rise, lowering the payout ratio and allowing the REIT to retain more cash flow to fund future growth internally. As Uniti's reliance on Windstream decreases over time, the company's relatively safer dividend should increase the UNIT's share price, potentially allowing the REIT to once again sell new shares at profitable prices that allow it to grow even faster. Increasing cash flow and decreasing Windstream concentration risk should then lead to credit upgrades, lowering borrowing costs and further allowing management to achieve the REIT's full growth potential. In fact, management has said that it believes the current dividend is sustainable and will be able to eventually start growing again once the turnaround plan has succeeded. If true, Uniti could be a potentially interesting "deep value" high-yield income investment, assuming that both the master lease holds up in bankruptcy court, and that management can execute well on its diversification plan despite the firm's high cost of capital. However, investors must realize that Uniti Group's turnaround plan is not guaranteed to succeed. In fact, the turnaround plan went rather poorly in 2017, with AFFO per share actually shrank 4%. All stocks have inherent risks, but any dividend stock yielding nearly 15% should be a clear red flag to investors. The market is pricing in a high risk of a dividend cut due to large concerns about several aspects of the business. In this case, Uniti faces three key challenges. The first is the REIT's extremely heavy reliance on Windstream, which has been suffering from a secular decline in its legacy landline business. Despite numerous acquisitions, Windstream's revenue over the last three years has been flat, while operating cash flow is down 32%, including a nearly 7% drop in 2017. And thanks to a large debt load, Windstream has been downgraded across the board by credit rating agencies. In fact, Moody's recently cut Windstream's debt rating to Caa2, the S&P equivalent of CCC. This means that the agency considers Windstream's debt to be extremely speculative and just one notch above "imminent default with little prospect for recovery." The risk is that Windstream will go bankrupt, at which point the masterlease could be challenged in bankruptcy court. That's because a restructuring Windstream might be pressured by bond holders to extract rent concessions from Uniti. Those concerns seem valid given the vast amount of money Windstream pays Uniti. The master lease provided for an initial annual rent of $650 million (paid in equal monthly installments), which has since increased slightly. To put that figure in perspective, it represents over 11% of Windstream's total sales. Windstream also only generated between $925 million and $950 million in operating cash flow each year in 2016 and 2017. Slashing its annual rent obligation to Uniti by even 10% would provide a nice lift. While Windstream's solvency may not be an immediate concern, the company is not out of the woods. Per Moody's, Windstream has a $775 million credit facility and over $490 million in unsecured bonds coming due in 2020. Even if the company were to refinance that debt, about $1.2 billion in term loans comes due in 2021. Moody's believes that in a rising interest rate environment, Windstream's continued declining cash flow might make it impossible to refinance these loans in a few years, likely driving the company into bankruptcy. That, in turn, would put the "master lease guarantees Uniti's dividend is safe" thesis to the ultimate test. Uniti faces its own problems when it comes to dividend safety, too. For example, Uniti's adjusted funds from operation (AFFO) barely covers the dividend today. In fact, Uniti's AFFO payout ratio was 96% in 2017. Management forecasts that the REIT's AFFO payout ratio will decline to just 93% by the end of 2018. In other words, Uniti will only be retaining 7% of its cash flow, or about $8 million per year. In contrast, the company's 2018 capex plans call for $265 million in spending, including $93 million on new towers, with the rest on its non-Windstream fiber business. As a result, the REIT will have to continue funding its growth and diversification plans via its remaining revolving credit capacity ($470 million at the end of 2017) and unrestricted cash (about $60 million). With liquidity declining, Uniti's flexibility to maintain its high payout ratio and continue expanding its non-Windstream asset base is under pressure. In fact, management expects Windstream will still represent 67% of revenue by the end of 2018, a far cry from the 50% goal it still hopes to achieve by mid-2019. Essentially, Uniti's biggest problem might be that it's in a liquidity trap. Despite meaningful growth opportunities, the company is struggling to find enough enough cheap capital to actually take advantage of it. With its share price in the dumps and offering a double-digit dividend yield (higher than the 6% to 9% recent cash yields it has achieved on new investments), Uniti has to rely on cheap debt and what little retained AFFO it has to fund profitable growth. Unfortunately, the primary source of the company's incremental liquidity, its revolving credit facility, provides financing under variable rates. Should interest rates continue rising, Uniti's borrowing costs will continue creeping higher, putting further pressure on the cash yields its investments must generate. With a junk credit rating of "B" from S&P, Uniti appears to have very little margin for error. Acquisition-focused growth strategies are often risky to begin with, but Uniti's situation is especially dicey since the company is under pressure to rapidly diversify (perhaps chasing deals it otherwise wouldn't), faces rising costs of capital (needs to reach for more speculative deals that offer higher cash yields), and is seeing its liquidity diminish (more pressure to act sooner than later). In order to grow its AFFO per share quickly and reduce the risk of a dividend cut, the company needs access to cheap debt and equity capital. But as long as the vast majority of its rent comes from troubled Windstream, neither debt nor equity markets are likely to roll the dice on the company. As a result, any growth in AFFO per share the REIT is able to achieve will likely be very slow. With Uniti carrying its own substantial debt burden ($4.5 billion on the books, including over $2 billion due in 2022), management's diversification plans ultimately may not be enough to help the company reach a safer payout ratio in time. In other words, Uniti Group appears to be cheap for a reason and is a very high risk dividend stock. The company's payout could be reduce substantially at any time in order to redirect the cash flow to the REIT's much needed diversification efforts. With interest rates still at historically low levels, many stocks offering double-digit yields might appear attractive to income investors. However, anytime a yield is this high, investors need to be especially focused on risks to the dividend. In this case, Uniti's high yield is due to some major problems that the REIT has not yet shown an ability to overcome. The company's reliance on just one distressed tenant has caused its own credit ratings to be slashed to low-grade junk status, and Uniti now faces an inability to raise any equity capital at profitable prices. While Uniti's dividend is currently covered by cash flow that is expected to rise very slowly, the company's ability to ultimately secure its dividend for the long term is in doubt. Simply put, Uniti Group is a very high risk stock with a wide range of potential outcomes, making it inappropriate for conservative income investors.